Walk through two case studies, and take a deep dive into the joint filtering work done in the platform to have a stable hand cursor. The module includes a depth-based approach to gesture detection and presents the advantages this can have over a skeleton joint-based approach. Thanks for very interesting talk ! I would be interested in source code too. And the swipe detection with frames too. Will it be part of the SDK it seems to be a must have for gesture recognition ! About next talks, that would be really really great to have sample / guide / help / ... about how to perform object recognition and tracking. There is great algorithm like Predator in 2012 and CMT in 2014 that would be so cool to have this missing feature in Kinect SDK. I mean: I take an object in my hand, then I follow the object based of shapes or depth ? Another module in the series, giving a more indepth intro to developing interactive 3d apps using body tracking and some choice extra 3d libraries? System cursor for Unity please! Can you please provide the system cursor source. Hey everybody, sorry for the delay on the cursor source code. I've handed it off to our samples guy and he's working on making it publicly available. 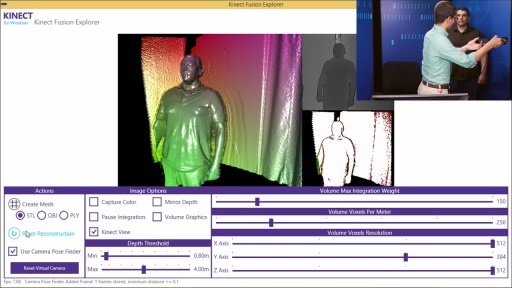 is there a way to extract fbx, bvh from the kinect v2? Can you please share the source code, it's been over 6 months! @CaseyMeekhof: Hi Casey. Amazing presentation! I was wondering if there was any word on getting the source code available to the public for the MotionMan program you presented. I am trying to do something similar but my work is not producing nearly as much accuracy and sophistication as your code displayed so I was hoping to be able to see how your code was actually dealing with background and filtering of the depth data. I am also interested in source code. 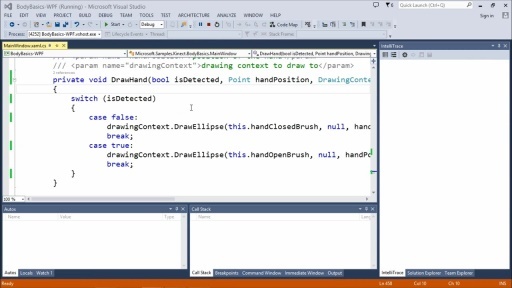 Sir kindly gave me code or tutorial how to body tracking in colored image in window store app using kinect v2.